Extreme use of CIAK STARTER MOTO AGM battery is understandable. Advantage of this battery is the AGM (Absorbed glass mat) technology that enables maintenance-free usage. That way costs of going to the repair shop reduce, as well as subsequent maintenance, and it disables electrolyte (acid) leakage from the case regardless of the place or position of the installation. Absorbed glass mat (AGM) material enables twice the stability than found in usual batteries with liquid electrolyte which prolongs life cycle of the battery. 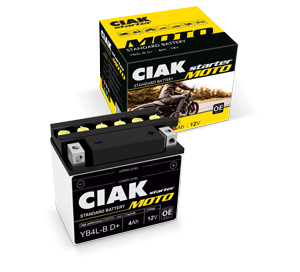 With this technology CIAK Starter Moto AGM battery provides considerably larger capacity than traditional battery with same dimensions. Absorbed electrolyte is equally retained on each net which results in reduction of internal resistance, charging is faster and energy delivery is better. 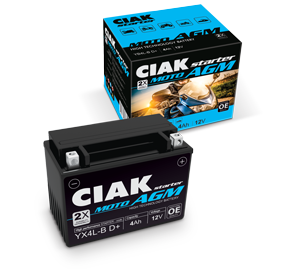 CIAK STARTER MOTO AGM is developed for high performance motorcycles with increased energy requirements, but also for the simplest motorcycle for everyday use. Our best-selling product from moto assortment is a powerful, long-lasting and very reliable battery. It is also economical, simple and practical for installing. This battery has reliable starting power and continuous energy delivery. Tested in the hardest conditions and used on different motorcycle models for different purposes this battery always equally and reliably meets all imposed requirements. It is perfect for older motorcycles or newer ones that do not have increased number of consumers. CIAK STARTER MOTO is ideal for scooters, quads, Jet-skis. Technology of this battery enables simple formation and activation. All CIAK STARTER MOTO batteries are delivered with accompanying acid. Long-lasting testing resulted in a robust construction resistant to vibrations even when you are riding on a tough terrain, snow or waves. ROYAL CLASS BATTERIES FOR MOTORCYCLES The latest Moto battery with lithium technology. It is primarily intended for motorcycle users who frequently visit racing tracks of all kinds and for users who want to save on motorcycle weight. Lithium moto battery is 63% lighter than the average moto battery. They are equally intended for every motorcycle whose owner wants to have ideal energy supply at every moment and in every application. It is a perfect option for motorcycles with a lot of consumers (heated grips, radio, coolers in travel bags, additional lights, ride by wire technology and so on). 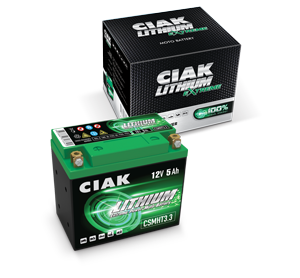 CIAK LITHIUM EXTREME – is ideal actuator and energy supplier for both ATVs and Jet Ski vessels and because of its technological characteristics it is possible to install it anywhere and on any position vehicle manufacturers place before it. LION power by CIAK – Royal class.